Oswaldo Garcia Padilla says he has experienced firsthand the brutality of Venezuelan President Nicolas Maduro's regime. "They locked me in a very small room. 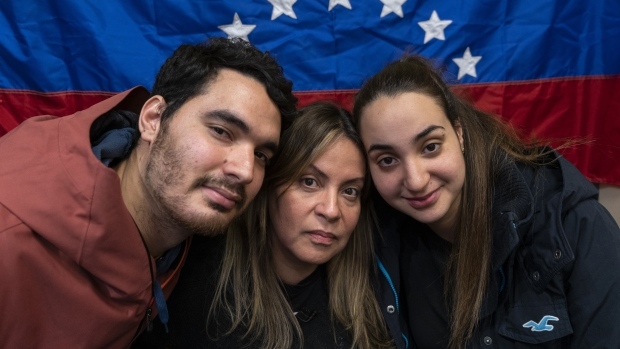 Every moment they hit me," Garcia Padilla, 25, said in an interview this week in Montreal where he, his sister Fabiola, 23, and their mother Sorbay Padilla De Garcia are exiled. "They put guns in my mouth," Garcia Padilla continued, looking at the floor. "They hit me with a gun. They put a bag on my head and put tear gas in it and closed the bag. I passed out. They used electricity all over my body. I only ate once in four days." On Monday, Canada will host a meeting in Ottawa of Western Hemisphere countries, known as the Lima Group, to address the political and economic crisis in Venezuela. The family says they have been assured by Global Affairs Canada that Garcia Palomo's detention will be raised at the meeting. The Lima Group was formed in August 2017 to address Venezuela's slide into authoritarianism. Millions of Venezuelans have fled the country, which is struggling with hyperinflation, widespread food shortages and anemic economic activity. Last week, Juan Guaido, the head of the opposition-controlled congress, declared that he had assumed presidential powers under the constitution and planned to hold fresh elections to end Maduro's "dictatorship." Guaido's leadership over the country was quickly recognized by the United States, Canada and many Latin American nations. The retired colonel's wife doesn't speak English, but her words were translated by her daughter during the interview. Padilla De Garcia said she wants the Lima Group meeting to recognize that members of the Venezuelan military support her husband and are ready to overthrow the regime. High-ranking members of the military, however, continue to support Maduro. "The flame is alive," Padilla De Garcia said. The regime might have captured her husband, but there are elements in the military ready who are ready to desert Maduro, she said. "They know something is coming." She said she believes it's a matter of weeks before Maduro is removed from office. On Thursday, Venezuelan Interior Minister Nestor Reverol said Garcia Palomo was among a group of "terrorists" plotting to assassinate Maduro who had been arrested. Padilla De Garcia said she last spoke to her husband on Saturday. The family says they are certain he is being tortured because members of the military loyal to him have sent them messages. "There are people who follow my father and then send these messages to other people, and these people tell us," the retired colonel's son said. "That's why they are so afraid of my father. They don't want anyone to hear his voice because they know people will follow." In a December interview with Bloomberg news, Garcia Palomo said, "Our colleagues in Venezuela need to know that we're working every day to combine international and national forces, and remove the government through the use of arms so the country doesn't continue to bleed out and die." He was part of a foiled plot called "Operation Constitution" to overthrow Maduro before last May's election. "That's my father's spirit," said Oswaldo Garcia Padilla. "More and more countries are recognizing (Guaido). We are advancing every day. We have the support of the whole democratic world."